Hands down, the #1 question I get all the time is whether or not I'll be writing books for the kids. You know the ones... Jack & Cassie's kids. And every time someone asks me that, I want to scream from the rooftops, YES! YES! OMG, HELL TO THE YES!!!!! But if I did that, the next question would be... WHEN? WHEN? WHEEEEEEEEEEEEEEEEEEEEEEEEEEEEEEEEEEEEEEEEEN?????? And that's the thing about me as a writer.... I simply cannot force my stories. I can't make them come to life in my mind just because I think I'm ready to start writing them. There are a lot of other writers out there who map out their year; they know exactly what they'll be writing and when and I see those lists and always wonder how on Earth they can possibly do that? Because I have a list of books I want to write (and yeah, they're even written down too)- but I don't know WHEN they'll get written. The honest to God truth is, I have at least (AT LEAST!) 10 books that are in various stages of being written on my computer. I can't make myself write this story or that one; I have to feeeeeeeeeeeeeeeel it. I add to those stories as they call to me...write pieces of them as I feel pulled too. It has to be ready to come out... almost like a birthing process. TMI? Probably, but it's still the cold hard truth when it comes to me and my writing style. Until one of them demands all of my attention, my attention is scattered among all of them. Trust me, I've tried to force certain stories out before. And it does.not.work. Audio versions of my books? 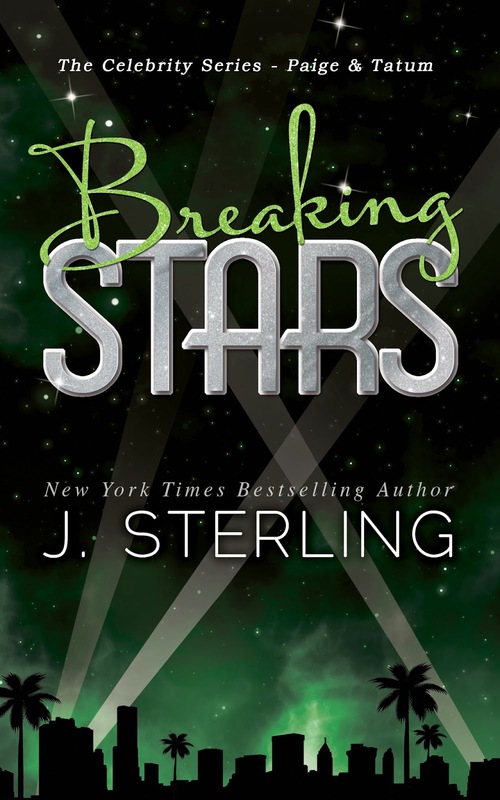 You can pre-order Breaking Stars today! Hi everyone! I've sent Breaking Stars (Paige's story in The Celebrity Series) off to the editor! To celebrate, I've put it up for PRE-ORDER on all the sites (still waiting on iBooks, but it should be up soon)! This book will be released on JUNE 29th! I... can't... even... there are no words. Well, there are words like "thank you" and "oh my gosh" and things like that- but they seem so stupid. I'm overwhelmed with this honor. And yes, I do feel honored. I just got home a little over an hour ago from Blake's baseball game and I logged online to SO MUCH LOVE from everyone about my hitting the New York Times news. First of all, I wanted to express my sincerest thanks to this community. My fellow authors, my readers, strangers and friends alike- your comments, your words, your support is so humbling to me, you have no idea. I just finished reading every single comment, looked at every single post and responded to every single email. I hope you know how much I appreciate the time you take to make ME feel special. Because that's what you've all done for me tonight- you've celebrated with me, you've been happy for me, you've congratulated me and I can not thank you all enough for your kindness. It took me 4 years and 8 book releases to hit this list, so this wasn't something that happened for me overnight. And in that same regard, I know that there are still so many authors out there who have worked longer, worked harder, and released far more than 8 novels, who are still trying to hit it. To those writers, please know that I never ever take this for granted and yes, I do know how lucky I am. Again, I just really wanted to thank each one of you for being so genuinely thrilled for me. It has been your reactions and words that have made me tear up more than hitting the list did. I love and respect so many of you. Thank you for loving and respecting me back. The Game Series on Sale! Amazon has put The Perfect Game and The Game Changer on sale for $2.00 each! If you haven't read them, or know someone who needs to- go grab them now while they're only two bucks instead of $3.99 each! People always ask me how they can "help" or what they can do when it comes to spreading the word about my books. The two things I always tell them are #1- to leave a spoiler-free (if possible) review wherever they bought the book from and on Goodreads if they are a member. And #2- to recommend any book they loved to their friends, peers, people who love reading, etc. Here are the links to purchase 10 Years Later wherever e-books are sold! Thank you so much for reading Dalton & Cammie's story. Now listen to "THE" song. Enjoy.